At the age of 65, Lila Cerullo, the best friend of Elena Greco who is the 1st person protagonist, is missing. She is entirely missing, artifacts and all. It seems Lila has decided to erase herself from the world. Trying to deal with Lila’s son and the situation, Elena takes on the task of recounting her memories of her dear friend. Elena and Lila (Raffaella) Cerullo were friends since elementary school in an old Neopolitan speaking semi-suburban neighborhood in post-WWII Naples. As Elena goes from elementary school to middle school and then high school, Lila, who is much smarter is pulled out to work in her father’s shoe shop. They have dolls and then boyfriends – a supposedly “evil” neighbor, Don Achille Carracci, is murdered, and another man jailed for it. A neighbor family moves away and the father writes poetry, while a “mad” widow with several children seems to decline in all ways. That much could be kind of interesting in the hands of a good writer (and Ferrante is a good writer) but the truly compelling aspect is that as the girls grow up they learn of what went before – the Nazis, the Communists, the money, etc. and how these things influence the lives of the people in the neighborhood now. They come to know these things even if the adults are determined to cover it all up with silence. The past lurks. But there is a present as well, and a new “family” is now present, a replacement for the old bad guy, Don Achille. The Solaro family with it’s two older boys pose serious threat to the well-being of the community – or do they? This is a wonderfully well written coming-of-age story told in episodic fashion. The main themes do not get going until half-way into the book – at least they didn’t for me. 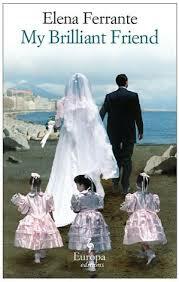 James Wood liked it and said so in the New Yorker – Elena Ferrante is a very important Italian writer. This book could likely take place almost anywhere and that’s probably what makes it internationally popular. The family feuds of an old neighborhood are found in New York, Mumbai, Moscow and elsewhere. Women with an intellectual bend might really appreciate Ferrante’s novel because of Lila’s pursuit of academics while her friend, Lina, has to go the way of work and marriage – there was a huge identification factor for me. I’ve heard there are to be sequels – I’ll surely look forward to them. This is next on my TBR pile (after my book club book which is killing me…) Glad to hear you liked it so much!